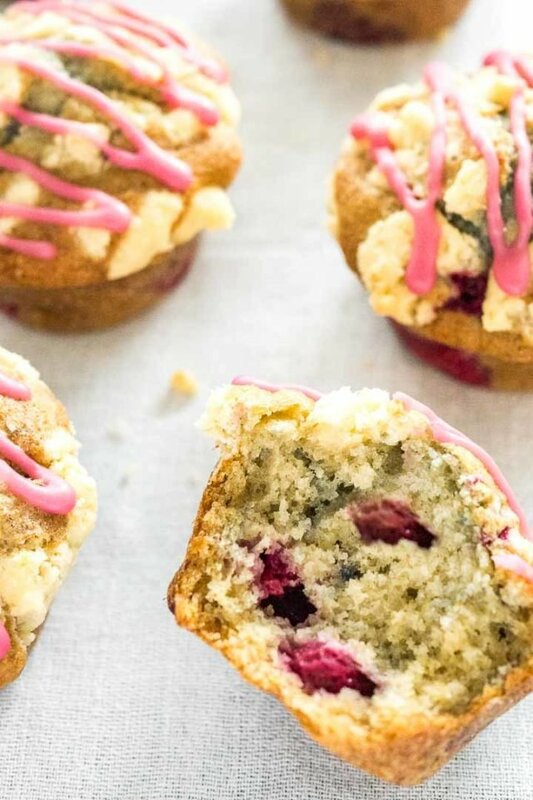 Raspberry Muffins are fluffy, tender and bursting with juicy raspberries! 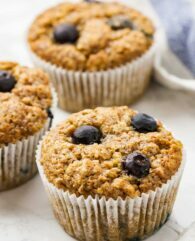 This simple but so tasty muffin recipe is easy and quick to make from scratch and always a hit when I make it. 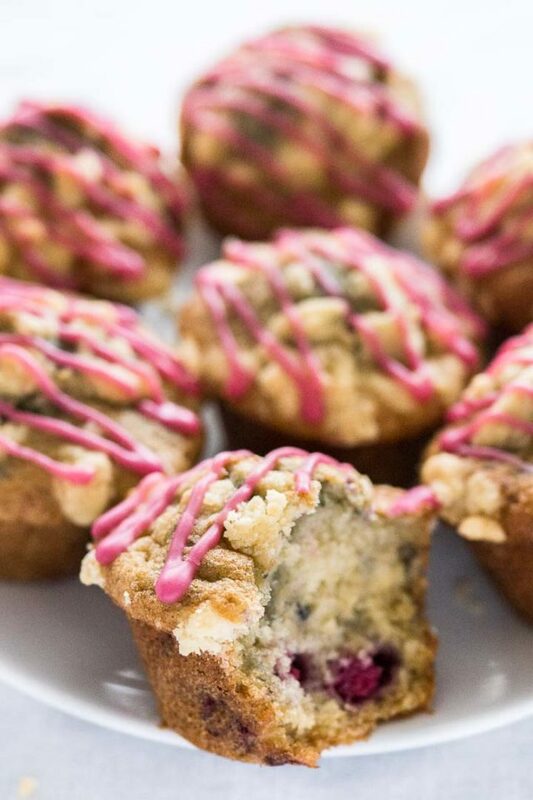 Raspberry crumb muffins are a great breakfast treat and keep moist and fresh for days. 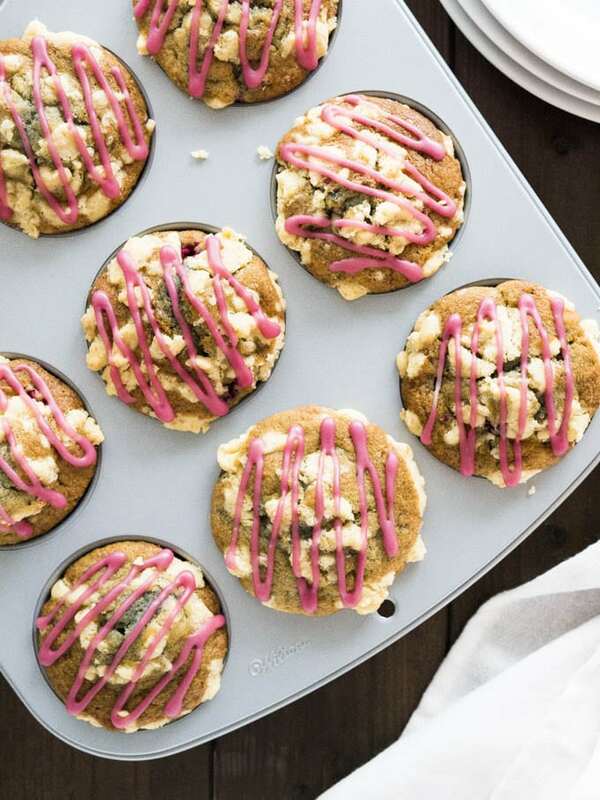 These Raspberry Muffins make a perfect easy breakfast treat. You can make them in advance and they will taste great even after a few days. 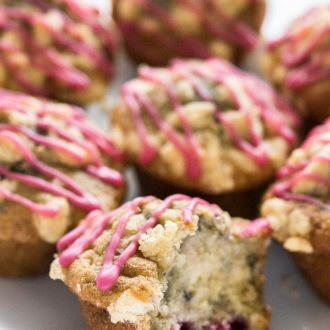 What could be better than combining raspberries with a delicious streusel topping in a moist and buttery muffin?! Raspberries are probably one of my favorite fruits! Sadly the berry season is rather short here and finding good looking ones can get complicated (and expensive). Because of that, I made sure that this recipe also works perfectly with frozen raspberries. These muffins are topped with a delicious streusel topping! I like my crumb topping a bit more “cookie” like and love bigger streusel, you are going to love it! And because I love pink so much I made a simple pink glaze (confectioners’ sugar and raspberry syrup) and drizzled it over my muffins. 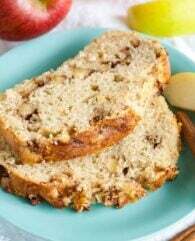 You have to try this simple recipe, it is always a hit! The first step is to not overmix the batter! If you overmix the combined ingredients your muffins will get heavy and dense. Not really what we’re aiming for here! To get bakery-style muffin tops you have to fill your muffin tins to the brim. The next thing is to bake your muffins at a high temperature for 5 minutes to get the tops rising and then reduce the temperature to a more normal one. By doing so you get beautiful muffin tops that are high! You can also use frozen raspberries in this recipe! If you’re using frozen raspberries don’t thaw them. Just use them directly out of the freezer. For this recipe, you’ll need buttermilk. To make your own buttermilk add one tablespoon lemon juice or white vinegar to a liquid measuring cup and add enough milk until it measures 3/4 cup. Want to try this easy Raspberry Muffin Recipe? Preheat your oven to 425F (220C) and line a 12-count muffin pan with muffin liners or grease with nonstick spray. To make the streusel, toss together the all-purpose flour, butter, and brown sugar in a small bowl. Set aside. In the bowl of a stand mixer or using a handheld mixer cream together the granulated sugar, butter, and brown sugar at medium-high speed for 4 minutes until pale and fluffy. Add the eggs, buttermilk, vanilla extract, lemon juice, and lemon zest. Beat for one minute on medium speed until everything is combined and smooth. Scrape down the sides of the bowl as needed. In another large bowl, combine the flour, baking powder, baking soda, and salt. Add the wet ingredients to the dry ingredients and combine them using a whisk. Whisk only until all the dry ingredients are wet and everything is combined. Don’t overmix! Fold in the raspberries with a rubber spatula. Divide the batter between the 12 muffin tins and fill the tins all the way to the top. Top with streusel. 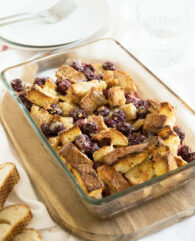 Bake for 5 minutes at 425F (220C) then lower the temperature to 350F (180C) and bake for 18 to 20 more minutes. The muffins are done when a skewer comes out clean. Beautiful photos, Julia! That pink raspberry glaze really makes the muffins pop.